In the fall, we had our son’s bathroom remodeled from your typical small full bath to a accessible bathroom with a roll in shower area. This has been a lifesaver in our household. Lifting a 80 pound child out of his wheelchair, into the bathroom and then up over the bathtub was doing a number on my back. Add to that the safety concerns of picking up a slippery wet child and this project was a necessity. This allows us to roll his special shower wheelchair right into the room and into the shower. Lifesaver, I tell you. I’ll show you the decor photos first and put the technical information down toward the bottom, so all of you who want to bail early can just scroll through the pretty stuff. This is what the bathroom used to look like. Bathtub with tub surround and shower, a typical toilet and vanity area. To give you perspective, the room measures roughly 5 1/2′ by 9′. 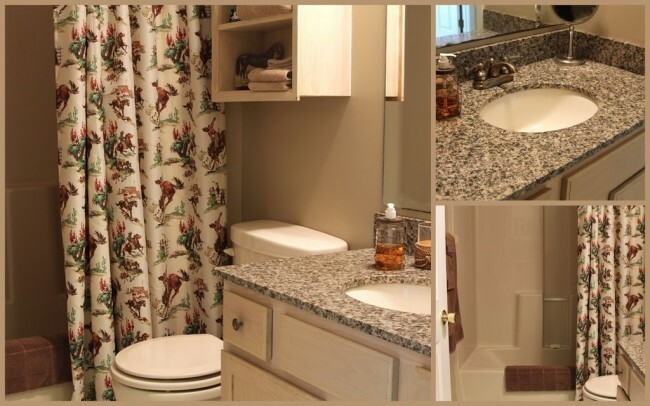 I sort of liked it as is with the vintage cowboy theme going on and little granite topped vanity, but this remodel had very little to do with looks and everything to do with function. So out with what was not working and in with something that would work. The wall color is Martha Stewart’s Bedford Gray, but in Home Depot’s Glidden paint. 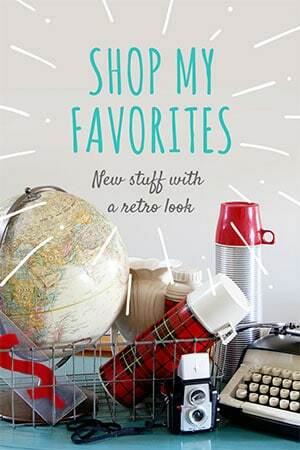 The metal sap bucket, oil can and locker baskets were antique store and barn sale finds. 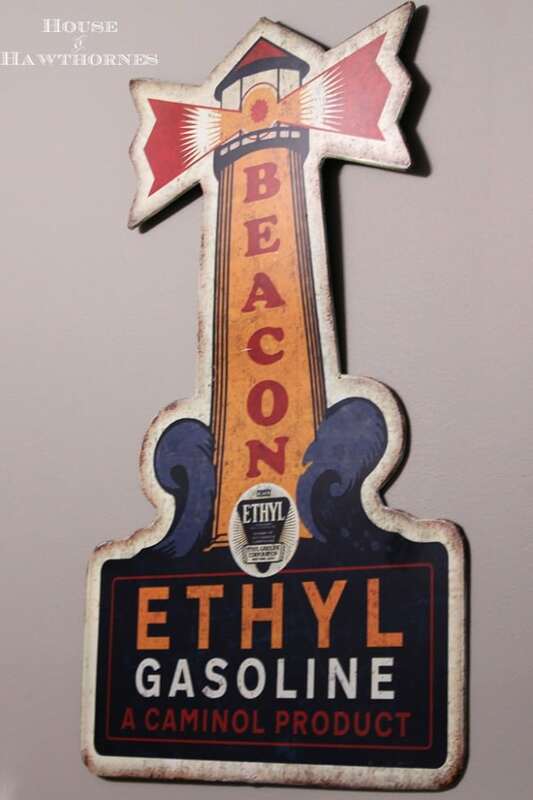 The Beacon Gasoline sign was from Hobby Lobby. I bought it when it was 50% off, because no one ever pays full price for anything at Hobby Lobby. Ever. This was not a DIY project. At all. Way too much plumbing, hvac, permits, inspections and structural stuff were involved. I don’t have any photos of the remodel in progress, because it honestly made me want to throw up. Having someone hammer, saw and drag stuff in and out of my house was a traumatic experience. The thought of taking a photo of it made me queasy. Yes, I have issues. So in a nutshell, the room was demolished. Pam passed out and stayed in the fetal position for the next three weeks. 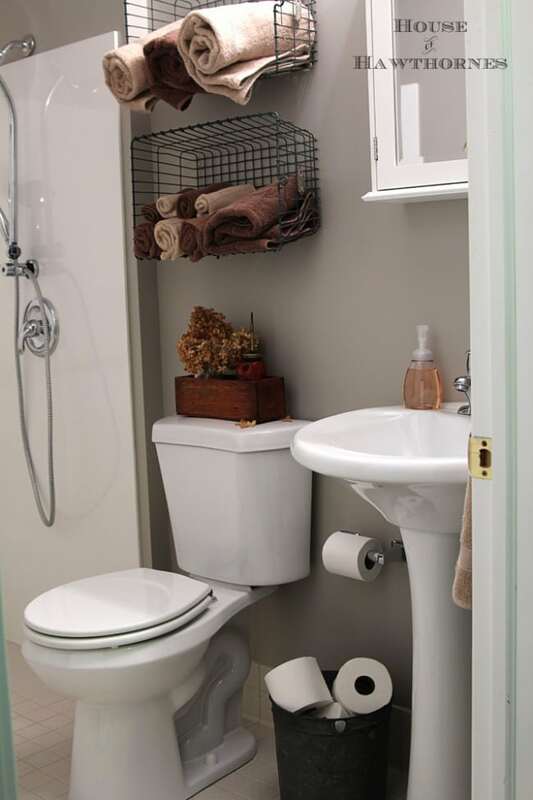 During that time, the sink and toilet were moved to the right to make room for a larger shower area. That means that the plumbing had to be redone. Although it’s not technically handicap accessible, we opted to have a pedestal sink rather than a roll under sink, since my son doesn’t actually ever roll up to the sink himself. The shower area was increased as much as possible (and code would allow). In order for the shower area to be able to be rolled into and the floor area to drain properly (there’s no barrier or lip to keep water in the shower), the floor joists were cut and angled (this is the part that freaked me the heck out), so there is a slight slope toward the drain. Bracing was then installed in the crawl space below this area to reinforce the floor. The hvac vent was moved from the floor to the wall, so water would not run into it. 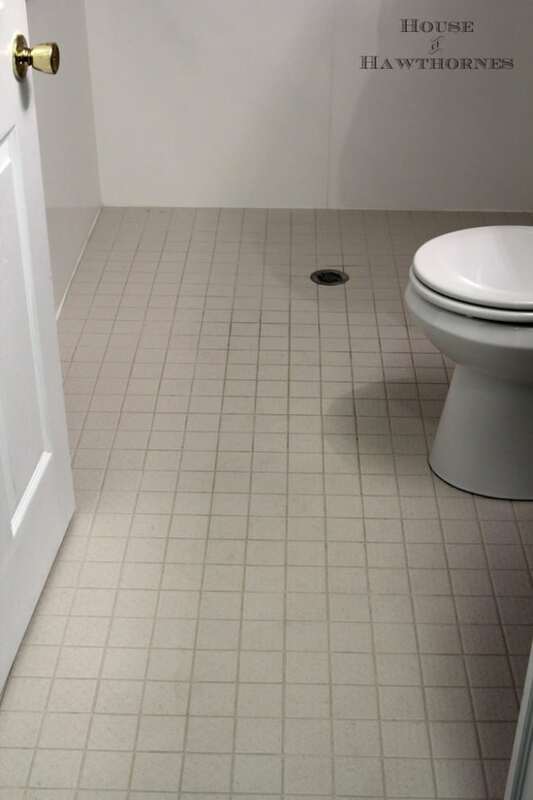 Tile underlayment and rubber membrane were installed over the entire floor, because technically the shower floor is the whole room. Not that it really ever gets that wet past the shower zone, but, just in case, you want it to be very waterproof. The tile has an x like raised pattern on it, so it is pretty much non slip. A movable shower head was installed and sheets of a cultured (man made) marble were used for the surround area. Grab bars were installed for the safety of the caregiver. Whoever is bathing my son stands right beside him in the shower and uses the handheld shower to bathe him. We tried it with the shower curtain and it seemed to just get in the way more than anything. And my husband kept banging his head into it. 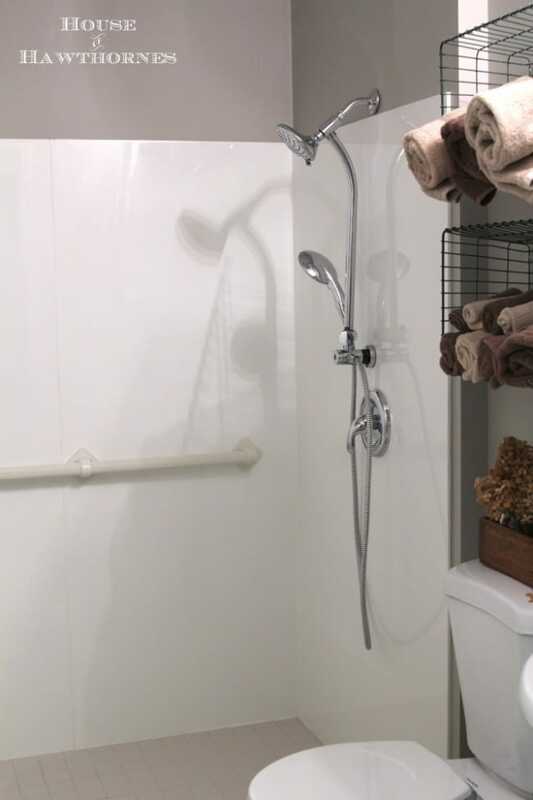 We’ve had no issues with over spray and when we have guests that will be using the shower, I have the tension shower rod and curtain ready to temporarily hang for them. This was one of the best things we’ve done to our house to make it more convenient for a wheelchair. OK, If anyone made it all the way through this post, you deserve an award! I don’t have one for you, but go buy yourself something pretty. Maybe an oil can or two. Pam, very glad you will have an easier time with the remodel. I love the decor and paint color. Good for you! 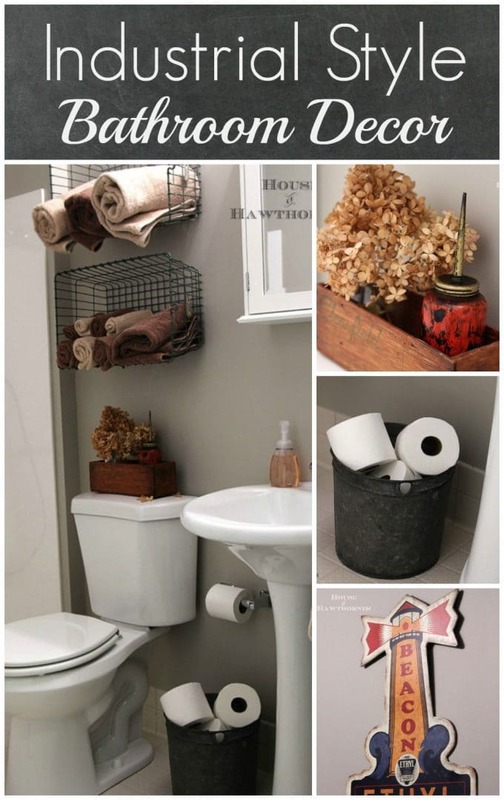 Love this — and love the baskets and oil can, and oh, that bucket of TP! My sister and her hubby built an addition with a larger bedroom and bath for their wheelchair-bound son. I think they would also agree it was the best thing they could’ve done! I think it is important to see how to remodel to accomodate all people. My MIL wouldn’t use her shower for years because she had to step over. She was in an apartment home for the elderly. I couldn’t believe that they had those kind of showers. You have to go through alot. I think you are the one that needs to go shopping, hah. What a time I had in this 1934 house when I was in the wheelchair and couldn’t get it through the bathroom door. (And it was a youth size!) This is excellent. Kudos to you & congrats for surviving! Happy to see that y’all have a better way for him to get a shower and it looks outstanding…you did a great job decorating it. You did such a great job of planning this room, Pam…so functional now…and the decorating you did made the room look so great, too! Love the sign from Hobby Lobby! 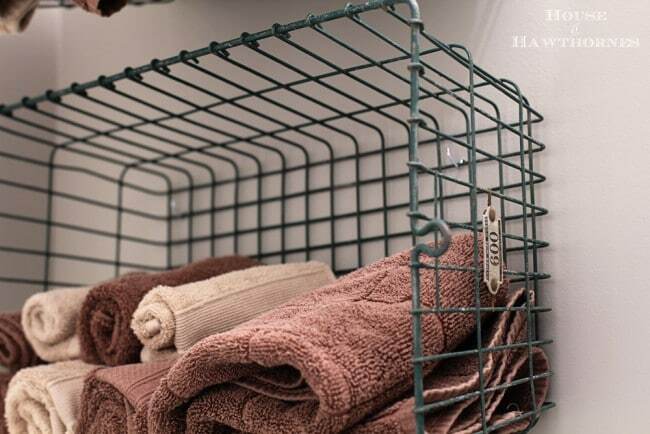 Such a great idea to use a tension rod curtain when you need it! This a functional and beautifully accessorized bath Pam. You must take care of Max and yourselves too. No way could we have done the sloping floor cause we mess up laying tiles flat. I love, love ,love this bath! You even managed to make the toilet paper rolls look fabulous! I bet life around your house will be so much easier, ok, maybe not easier but less stressful now. It looks great too! Nice color pallet. I love the bedford gray! I’m sure that this has been such a helpful change. Looks really great. I think I’d be right with you in the fetal position too! Being a care taker for my Mom, I think this bathroom is beyond wonderful! This will be so much safer and easier for you, your husband and son. I’m so happy you suffered through the rennovation to have this great result. It looks great too!!! Many thanks for sharing. First of all, it looks great Pam! But the ease it provides to you has got to be a huge relief to you. This would have been amazing to have at my mom’s house. I totally understand your pain about the 3 week rehab…..no fun! But obviously totally worth it! I made it all the way through and found it very interesting! The bathroom looks great and is functional for you and your son. Safety comes first and I’m glad you were able to get it done! You created a very pretty as well as extremely functional space!! I know how much having an accessible space means. Your vintage touches really give the bathroom a lot of personality, great job!! I enjoyed reading in your comment to me that he also has a toxic green wheelchair!! I read right to the last period. Wonderful change for the family. My daughter made a room of the basement “facilities” in her hundred odd year house. A tiny sink went in the corner across from the toilet and you literally walk through the shower to use the toilet. The ingenuity of it all. You’ve created a space that works well for you and looks cool, too! I was surprised that the sign was from Hobby Lobby and not a vintage find. It looks like it’s from the same era as the oil can. 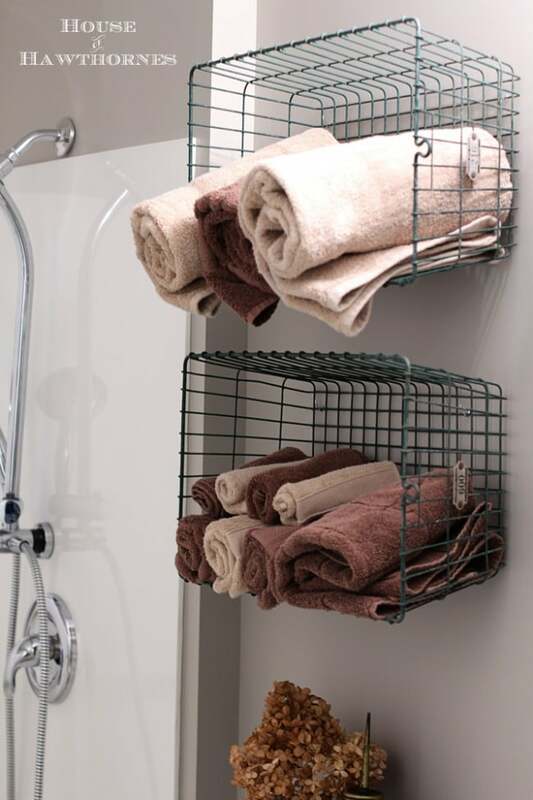 And I love the way you’ve hung the wire baskets on the wall for storage, too. Well done! That vintage sign looks like something Frank and would have negotiated on American Pickers. Awesome find. 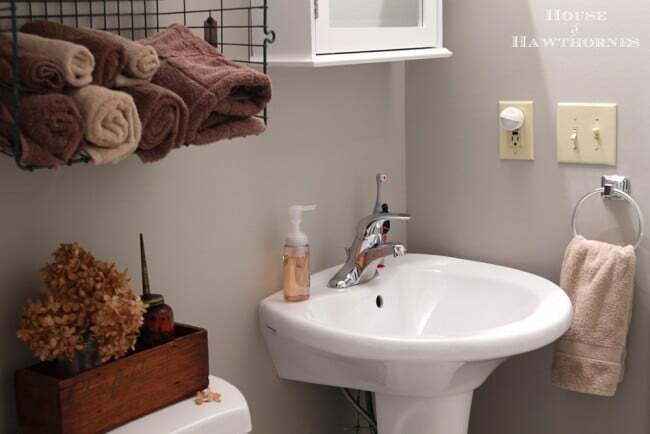 Your bathroom makeover is perfect in every way. I’m so happy for you. Pam. One word: Fantastic! There’s so much to love about this new bathroom. If I could go into a fetal position and end up with this I gladly would! 🙂 Love your vintage baskets and all those details that make so Cool! And I’m going to check out that paint color for my next bathroom paint job. That cowboy curtain was super cute, but I love the new look, too. And, yes, functional definitely trumps all–glad you have a set up that’s working better for you now! Pam – That looks great and it will make it so much easier on everyone. Your decor looks really awesome. I’m sure that will be so much easier on your back. Great job! What a great remodel and even though it was probably hard I’m glad you’ve made things easier for everyone. Your bathroom re-do is so nice. Functional & stylish! In the near future, we will re-do our master bathroom to eliminate the tub and enlarge the shower. Our autistic son can not wash himself properly, so my husband is the shower-giver. He’s 6’5″, and my son is 6’2″- both too big to fit in a standard shower. Thanks for the inspiration that it can be done! So glad the remodel makes your family’s life easier! And it looks amazing too! Love those locker baskets and that gasoline sign (can’t believe it’s a Hobby Lobby find)!! Lots to pin here! Of course I read the whole thing! That’s an awesome project to take on and obviously a lot of fear into it, too! I hope you don’t ever have to move. 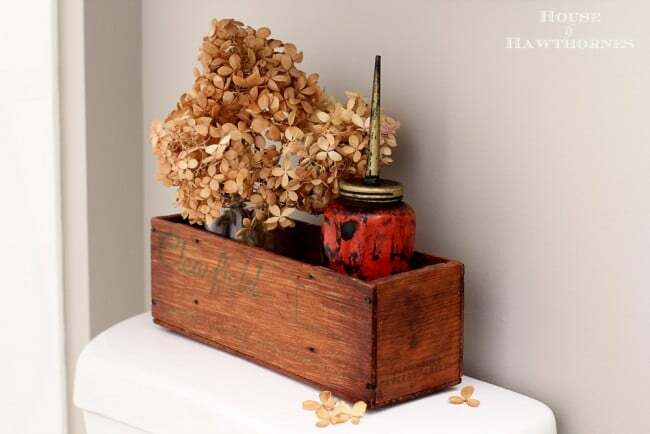 The vintage wooden box (I’m a box junkie) makes my heart go pitter patter and I Love what you did to make it cool and functional. I hope simple things like bathing are now less complicated and easier for all. I love your wire baskets and all the other details. 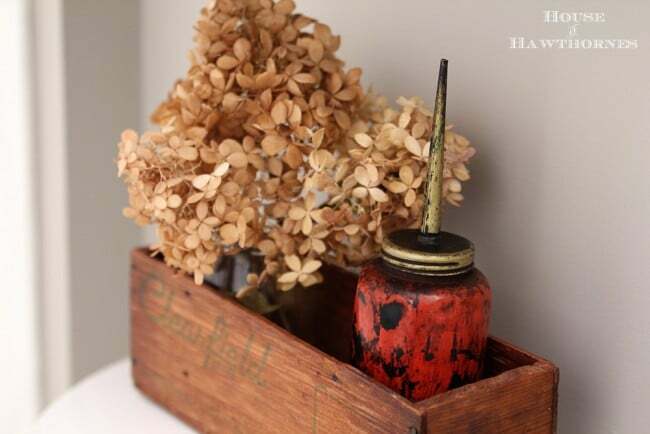 Your oil can reminds me the little collection I shared some time ago with my mother’s vintage sewing machine. Besides being so cute I’m glad you will all feel more comfortable now. What a practical and lovely bathroom. I can see how this would be so much better for you. Actually, Pam, I have dreamed of a shower like that. Easier to use and to clean, I would think. PINNED!!! Love it, thanks for sharing. Greetings from a new follower and new Blogger, please stop by if you have a chance. Beauty and function. I am sure this remodel has made your life easier and it looks fantastic as well. You showed that functional can be pretty too. Love the oil can and wire baskets. It should be easier to bathe your son now. I just love this wall color! I am searching for a grey color for our master bedroom and will have to keep this one in mind! 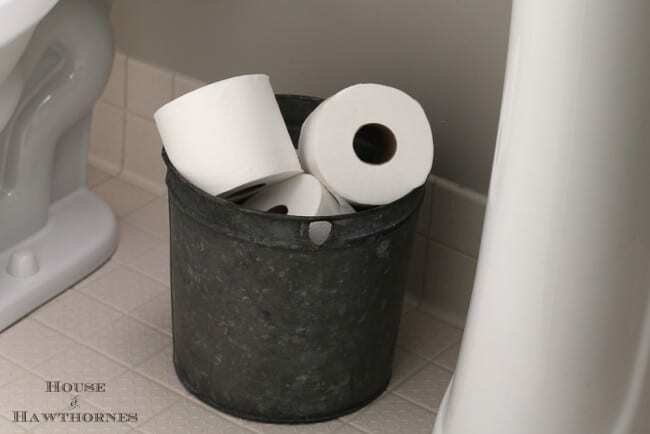 I really love the bucket with the TP too! Just beautiful! Excellent post! You did a GREAT job making choices for your family! We, too, are making these choices, and I always love to see how others are solving problems. Three weeks in the fetal position just might be worth it for such a lovely result! 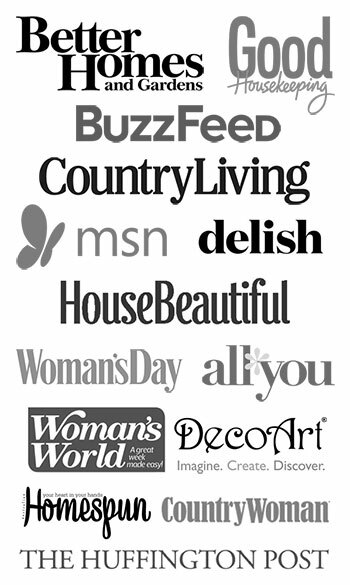 Just discovered your blog a few minutes ago. I have a daughter, 65 pounds, that I lift into and out of a tub, so I mostly know what you are talking about.So glad you have this beautiful bathroom as an answer. 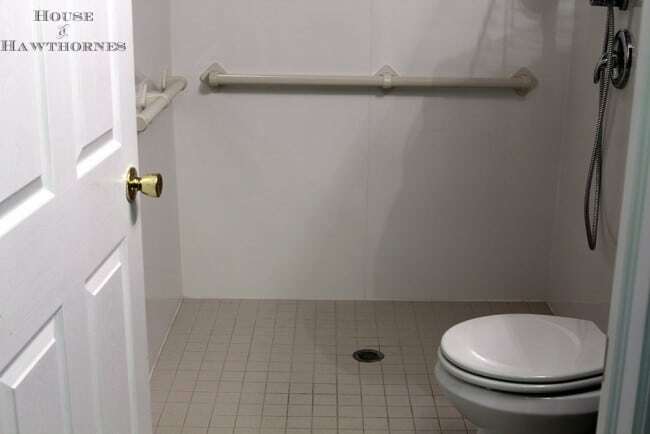 Pam – what a wonderful job on your accessible bathroom – i am sure you now feel it was worth all the pain of going through the remodel. Great decorations!